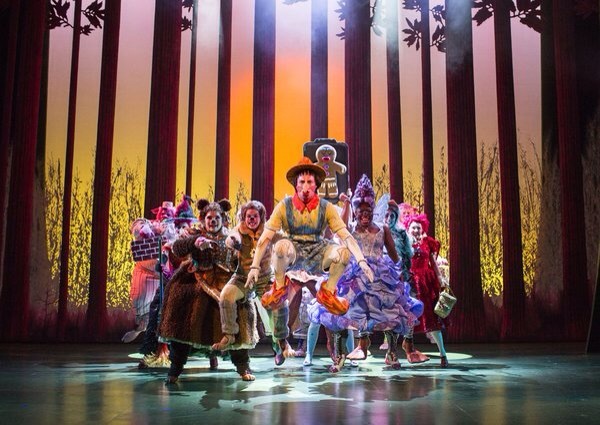 If like me you enjoyed the films of Shrek and saw it in the West End, then you to will enjoy this. It has everything, colourful costumes and sets. Humour, a few songs and more humour. This ogre has a big heart and Dean Chisnall continues to play it perfectly. In an attempt to reclaim his swamp home, he is sent on a journey to find a Princess to marry Lord Farquaad and therefore make him a King. Encountering a dragon on his way, he finds her and falls in love which makes for enchanting tale. 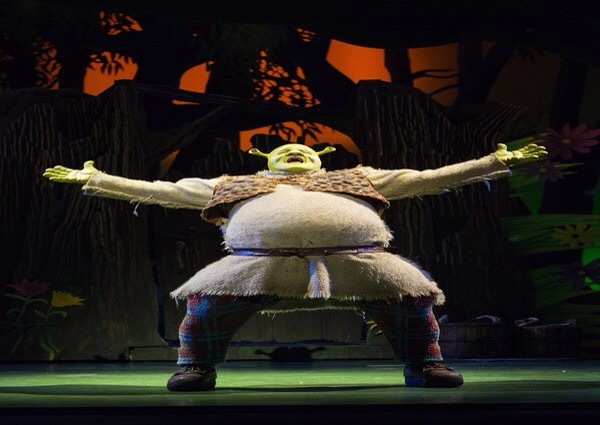 I can’t imagine anyone other than Dean Chisnell being Shrek as he has every characteristic of this loveable green “ogre” sown up! 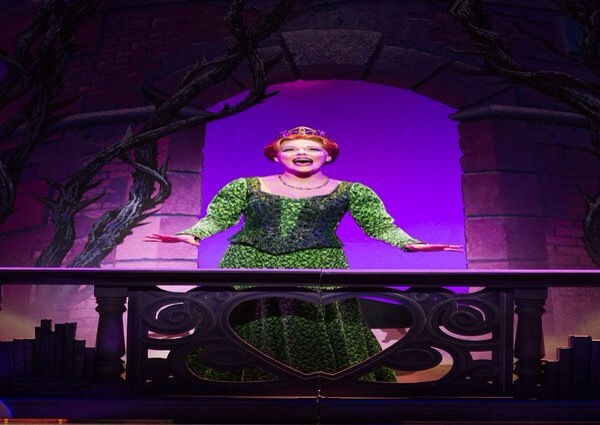 He is joined by his new Princess Fiona, Bronté Barbé who has a lovely voice and shone in the role. The performance wasn’t without its own drama within it. Young Fiona who was to be played by Lily Barrett was unwell and so there was a ten minute break to allow Olivia Weremijenko to take over. The performance continued with the song “I Know It’s today” involving the three Fiona’s which was beautifully done. 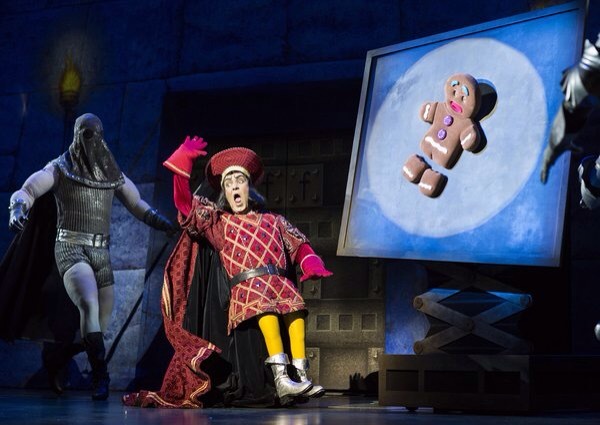 For me Gerard Carey as pint-sized villain ‘Lord Farquaad’, stole the show in parts. Much like his now director Nigel Harman, who starred as Lord Farquaad in the West End production, winning him the 2012 Laurence Olivier Award for Best Performance in a Supporting Role in a Musical. Such was his comedy timing, witty expressions and movement he had us all laughing out loud. Idriss Kargbo as Shrek’s wisecracking sidekick ‘Donkey’ was a loveable addition and complimented Dean Chisnell’s “Shrek” well. 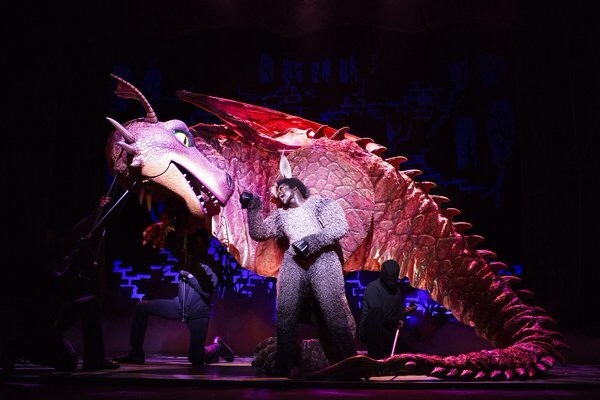 They are joined by a full company of fairy-tale characters which included Laura Baldwin, Nikki Bentley, Jennifer Caldwell, Candace Furbert, Will Haswell, Keith Henderson, Will Jennings, Iain Mattley, Christina Modestou, Sam Murphy, Amy Oxley, Ryan Reid, Jake Small, Dawn Williams, and Kevin Yates. All of which are exuberant in their roles and I found their scenes very entertaining to watch. I loved the “spot the nod to a West End musical” that you could play as well? I saw references to “The Lion King and more but it was the “Les Miserables” nod that really made me really chuckle. If you go, do see if you notice them. This show does exactly what you’d expect it to. It makes for a great evening of entertainment. There’s something in there for everyone and the children do seem to be engaged all the time which for a two and a half hour show, demonstrates its professionalism and how it stays true to its roots. If you have children they’ll love it, but if you haven’t don’t be put off, there are grown up jokes that go over children’s heads. Besides sometimes you just need a reminder, that some of us like “Peter Pan”never grow up and why should we when there is such spectacular fun to be had?